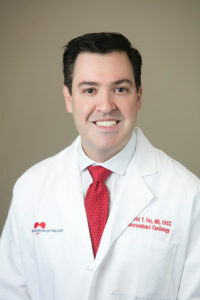 Gabriel T. Faz, MD, FACC is an Interventional Cardiologist. He is Board Certified in Cardiovascular Disease, Nuclear Cardiology, and Internal Medicine. Dr. Faz completed his undergraduate education at the University of Texas at San Antonio. He earned his Doctor of Medicine from The University of Texas Health Science Center in Houston, TX. He then completed residency in Internal Medicine at The University of Texas Medical Branch in Galveston, TX and fellowship in Cardiovascular Disease as well as Interventional Cardiology at University of Florida Health in Jacksonville, FL. His professional interests include active involvement with the American College of Cardiology, European Society of Cardiology, and the American Heart Association. Although Dr. Faz has a passion for Interventional Cardiology, he believes that combatting Cardiovascular Disease begins with prevention. He also has a research interest in antiplatelet therapies and a clinical interest in coronary and peripheral interventions as well as ASD/PFO closures. In his spare time, Dr. Faz enjoys traveling the world, spending time with family and friends, watching historical movies, singing, and playing the saxophone.